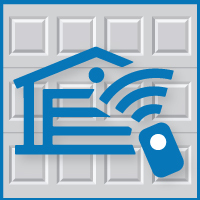 When it comes to garage door openers, there are a lot more options nowadays. In the past standard garage door openers such as chain-driven models, belt-driven models, and screw-driven openers were the only options available to those interested in automating their garage doors. Now, residential jackshaft and direct-drive models have been introduced. An article from Bob Vila, Garage Door Openers 101, shared details about the different types of garage door openers, including some advantages and disadvantages. We will share more details below. Standard garage door openers include chain-driven models, belt-drive openers, and screw-driven openers. A chain (similar to a bicycle chain) pushes or pulls a trolley that connects to a metal bar, called a J-arm, that is affixed to the garage door. Advantage: Newer chain-driven units with DC motors and soft start-and-stop technology are significantly quieter than older units. Disadvantage: If your garage is situated under a bedroom, the noise generated by metal-to-metal contact and vibration may be a nuisance. Very similar in design to chain-driven models, except a reinforced belt is the what pushes or pulls the trolley. Belts are made of fiberglass, polyurethane, or steel-reinforced rubber. Advantage: Belt-driven openers are just as reliable as chain-driven openers but quieter. Disadvantage: Belt-driven openers cost about $30 to $60 more than chain-driven units. With screw-driven openers, the trolley rides on a threaded-steel rod as a motor rotates the rod. Advantage: Because this design has fewer moving parts, manufacturers claim that it requires less maintenance than other systems. Screw-driven openers are among speediest these days, opening a door at 10- to 12-in. per second compared to the standard 6- to 8-in. per second. Disadvantage: Screw-driven openers have run into trouble in regions that have large swings in temperature from summer to winter. In addition, they are noisier than belt-driven openers. Unlike other garage door opener systems, jackshaft openers mount on the wall beside the garage door. A 24-v DC motor drives pulleys and cables that turn the torsion bar and raise the garage door. When the motor is reversed, cable tension is loosened and the door lowers. Advantage: This system is reliable and quiet. In addition, it keeps the ceiling free for overhead storage and is well-suited to garages with high or low ceilings. Disadvantage: Jackshaft openers are more expensive than most other types of openers. Developed and manufactured in Germany, the motor (not a trolley) travels along a stationary chain that is embedded in an overhead rail. A J-arm links the moving motor to the door. Advantage: Direct-drive units are claimed to be the quietest of all garage door units, because there is only one moving part—the motor. Direct-drive units cost about the same as belt-driven units and come with lifetime warranties. If you have any questions about garage door openers, please contact us. Blue Sky Builders offers LiftMaster garage door openers for all garages that we build. We can install these garage door openers for you when you build your new garage, or even fix existing garage door openers that you have.